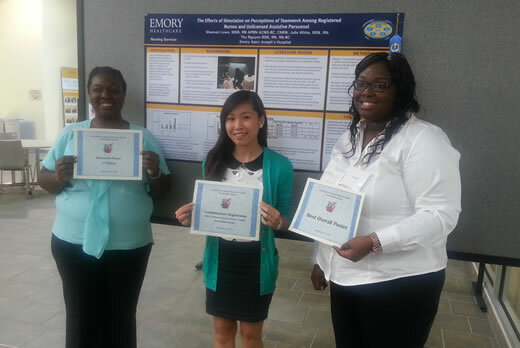 In a field of 40 posters and 114 research presentations, Emory Saint Joseph’s nurses won first, second and third place for nursing research. Emory Saint Joseph's Hospital nurses were awarded outstanding honors at the 8th Annual Evidence-Based Practice ToolKit for Bedside Nurses Conference. The conference, held at Kennesaw State University, included poster presentations from Emory Healthcare, Children's Healthcare of Atlanta, the Atlanta Veterans Affairs Medical Center and WellStar Health System. The conference focused on the ways in which nurses use evidence to improve their practice. In a field of 40 posters and 114 research presentations, Emory Saint Joseph's nurses won first, second and third place for nursing research. Shannah Lowe, Julia White and Thu Nguyen were awarded first place and best overall poster for their entry, “The Effects of Simulation on Perceptions of Teamwork Among Registered Nurses and Unlicensed Assistive Personnel.” Their research focused on the teamwork between registered nurses and unlicensed assistive personnel in the acute care setting, and the ways in which they effectively work together to care for patients and provide education to families. Second place was awarded to Teresa Foust, Heather Williams and Jasmine Moobed for the poster “Do Health Promotion Behaviors Affect Levels of Job Satisfaction and Job Stress for Nurses in an Acute Care Hospital?” This team studied nurses' participation in healthy behaviors and the correlation between these behaviors and job stress and job satisfaction. The research used four different survey tools to measure stress levels, job satisfaction and healthy behaviors adopted by nurses, such as counseling, getting enough sleep and the ability to relax. Cheryl Bittel, Lissy John Diaz, Julie Lewis and Wendy Mirbach received third place for their poster “Would a Wall Mounted Appointment Calendar and Goal Sheet Increase Coordination of Care and Decrease LOS for the Newly Implanted LVAD Patient?” In this research project, the objective was to coordinate the care of left ventricular assist device (LVAD) patients with a goal of reducing the length of stay and improving the multi-disciplinary coordination of care from the time of their implant. Bittel and her colleagues created an appointment calendar for each LVAD patient. The detailed schedule provides specific times for caregivers visiting patients such as occupational therapy, physical therapy, pharmacy, nutrition, social work and care coordination.